Incorporating Marshall's very own patent-pending Stompware technology, developed from the award-winning JVM Series, the MG footcontroller makes using the MG 'FX' amplifiers simplicity itself. 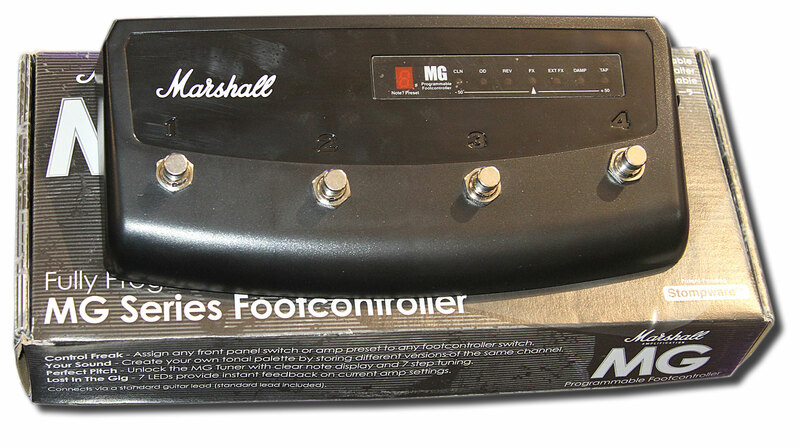 The MG footcontroller is totally programmable, with each of the four footswitches assignable to any front panel switch, preset channel and/or built in Tuner. A simple LED panel lets you know exactly what features and channels are engaged, while the digital display indicates the currently selected footswitch. When using the Tuner function the digital display shows the closest current note being played, as the LED panel is used to fine tune that note perfectly.